THE rise and dramatic fall of a cricket star is told in The Long Walk Back, a new play from Live Wire Theatre, at Dorchester Corn Exchange on Sunday 14th April at 7pm. 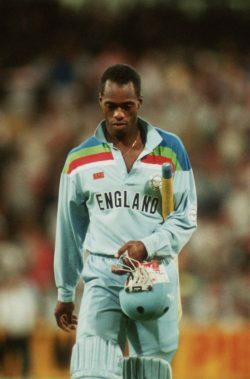 The show is based on the true story of England cricketer Chris Lewis’s catastrophic fall from grace. In 1994 he seemed to be on the verge of greatness when he was named England’s International Cricketer of the Year. But his life and his career were left in ruins in 2008 when he was sentenced to 13 years in prison for smuggling cocaine into the UK. The Long Walk Back charts the journey that took Lewis from disaster and despair to a profound moral awakening. After the performance there will be a question and answer session with Chris Lewis and RoughHouse Theatre director Shane Morgan. This visit marks a welcome return for Live Wire Theatre after previous visits with sports-themed plays When The Eye Has Gone and Hands Up for Jonny Wilkinson’s Right Boot.